Change php upload limits in order to upload larger files sizes to your sites. Disclaimer: In this post I’m sharing my experiences with you and do not claim to be an expert on this subject. My intent is to help you in your research. Proceed at your own risk. Here are some examples of what I’ve used successfully in various server environments. You will need root access to your server through terminal or something similar to Putty. You need to set the value of upload_max_filesize and post_max_size in your php.ini. 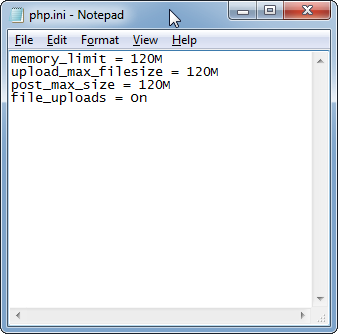 In php.ini find the Maximum allowed size for uploaded files, and change it's size to your requirement. Now find the Post Max Size and change it to your requirement, the post max must be greater than or equal to upload_max_filesize! After modifying php.ini file, you need to restart your HTTP server to use new configuration to work. If you can't change your php.ini, you're out of luck as you will need root access to your server.